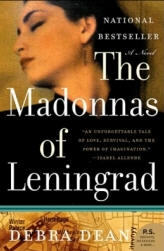 I just finished The Madonnas of Leningrad, by Debra Dean. Book Club Girl is hosting a radio show with Debra Dean today, 8/21 at 7pm EST. She was kind enough to send me a copy of the book. If you’d like to listen to the show, click here for more information. Now for the book.. simply said, I loved it. The story takes place in present day America, but is interspersed with flashbacks of the Siege of Leningrad where Nazi Germany attempted to capture Leningrad during World War II. The story centers around Marina, a young tour guide for the Hermitage Museum. She, and countless others, decide to remove the priceless masterpieces for safekeeping. They leave the empty frames up with the hope that one day, the masterpieces will be returned to their frames. During this time, Marina is forced endure the harshness of living in a war torn country. Living with others, in the basement of the museum, she is exposed to freezing temperatures, forced to live on very little food and has no choice but to watch those around her perish from starvation. Her one glimmer of hope, is thinking about her lover, Dimitri and who has left to work the front lines. Flash forward to present day. Marina is now 80 years old and battling Alzheimer’s. She is preparing to attend her granddaughter’s wedding with her husband, Dimitri. Her daughter Helen, is not aware of the Alzheimer’s until she sees her mother at the wedding. Her son, Andrei, is aware of the situation, but has not fully grasped the severity of her condition. Dimitri, who loves her dearly, continues to care for her as her condition declines. As the festivities of the wedding surround them, Marina escapes to the corners of her mind and revisits her childhood and her time in Leningrad. I’ve never known anyone that has battled with Alzheimer’s, but the thought of not even recognizing your own husband or child… just the mere thought, fills me with fear. For Marina, the memories that are most intact, are the ones that she created for her “memory palace”. During her time at the museum, her friend taught her how to envision each masterpiece within her mind, without it being present in the room. This created a “memory palace” of sorts. These are the memories that she can readily recall, but the more recent memories, such as her daughter’s divorce, are non-existent. As the novel unfolds, we follow Marina to those gallery halls as the author describes, in painstaking detail, what used to hang within the Hermitage. The writing here is so vivid. I could “see” those paintings as the author described them. I even went back and Googled them at one point to see if what I had envisioned was close to what the author described. This novel was bittersweet for me. It was beautifully written, well developed and a treat for the eyes. The appreciation of beauty and life, contrasted with the darkness of the city and the bleak winter that followed… I really felt for these characters and their personal hardships. Although we are given a glimpse of Marina’s current state (sad as it is), we are also given hope during the last few pages of the book. Not hope really, but closure. I felt completely satisfied when I finished and I don’t feel that way too often after finishing a book. The copy that I had, had some interesting information on the author as far as her background. I was surprised to see that she did not have a background in Art History. I am looking forward to hearing more about her background in today’s radio show with the author. If you have read the book..weigh-in and post a comment. What did you think of it? If you haven’t read it, I would highly recommend it. Add it to your TBR list today! I’m gonna have to disagree with you on this one (sorry!). I think I was more in love with the IDEA of this book than with the actual book. The stories of Marina’s life during the war – and the descriptions of the museum – were fascinating, but the whole thing felt rushed/cut short/unfinished … something like that.I reviewed this book < HREF="http://age30books.blogspot.com/2008/01/madonnas-of-leningrad-jan-08.html" REL="nofollow">here<> if you want to check it out. I’ll warn you though, it was one of my first reviews so it isn’t as detailed as the ones I write now. I really liked the book, too, but I love that we can all feel comfortable posting our opinions and engaging in gentle debate (I’m clicking over to read Heather’s review)I can’t call in for the Debra Dean talk tonight, but I’ve posted some questions on the Book Club Girl site. I’ll check in tomorrow to listen to the interview. I sent my question over to Jennifer but I plan to listen to the first half hour since I will still be at work in front of my computer. Everyone feels differently about books..even books that they agree they like. That is what is so great about book clubs and blogs… you give your opinion…you hear someone else’s and I almost always walk away with additional insight. I haven’t read this but it sure sounds like something I’d like! You’ve written a a lovely review.